This section describes how to work with discussion components in Studio. You can add discussion components to a unit to pose questions about other components, such as videos or text, in the unit. A discussion component gives learners a chance to respond to and interact with each other about a specific subject. Discussion topics that you create by adding discussion components in your course are known as content-specific discussion topics. For more information about discussions, see these topics. 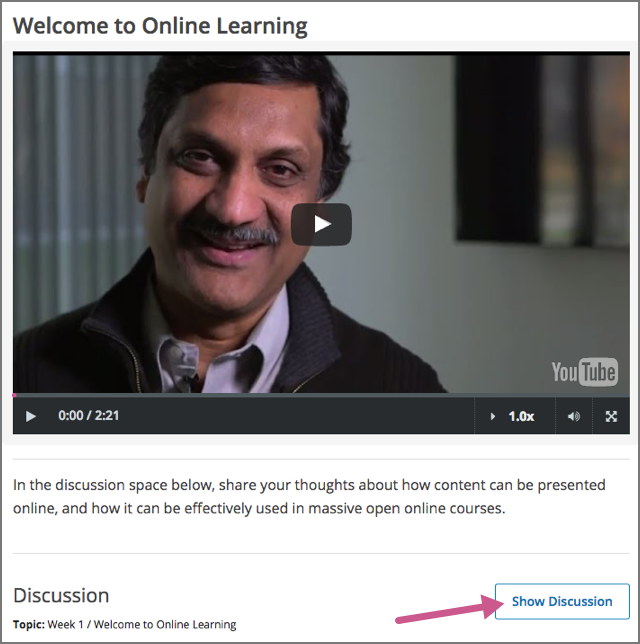 EdX recommends that you add an HTML component before each discussion component to introduce the topic that you want learners to discuss. The discussion component itself does not contain any text and can be easy for learners to overlook. Under Add New Component, select Discussion. You should always use these steps to create a discussion component. Do not create discussion components by using the Duplicate button in Studio. Duplicated discussion components result in discussion topics containing the same conversations, even if users post in different discussions. In the discussion component that appears, select Edit. Follow the guidelines in the editor to fill in the Category, the Display Name, and the Subcategory fields. Each Category/Subcategory pair for the discussion topics in your course must be unique. The value in the Display Name field identifies the discussion in the course content. The default display name for new discussion components is “Discussion”. Changing the default to a unique, descriptive display name can help you and your learners identify different topics quickly and accurately. If you delete the default display name and do not enter your own identifying name, the platform supplies “discussion” for you. The values in the Category (1) and Subcategory (2) fields are visible to learners in the list of discussion topics on the Discussion page. 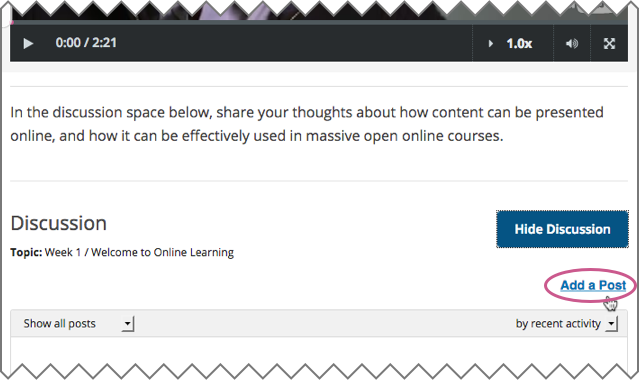 On the Discussion page, you cannot see category and subcategory names of discussion components that you created until after the course has started and the unit is released. For more details about when discussion topics are visible, see Visibility of Discussion Topics. 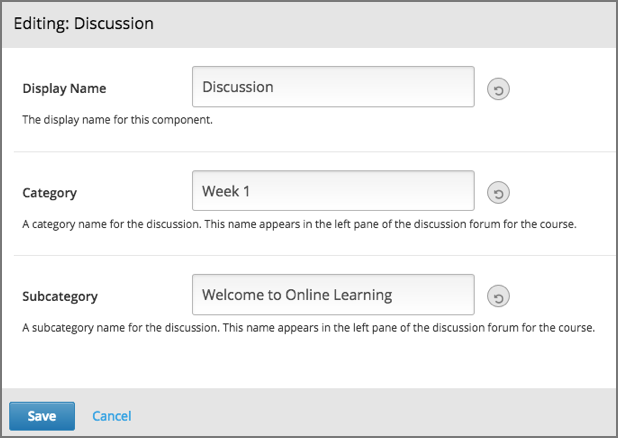 When you add a discussion component to a unit, in the LMS, learners see only the display name of the discussion component, the category and subcategory, and a Show Discussion option. EdX recommends that you add an HTML component before each discussion component where you add some text to introduce the discussion topic. In the following example, the discussion component follows video and HTML components. 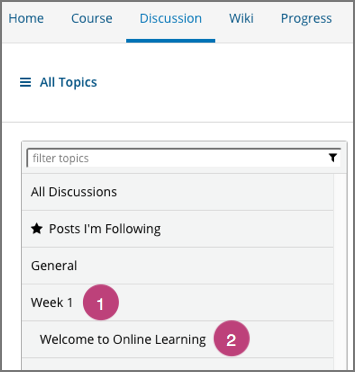 Learners must select Show Discussion to expand the discussion space and read the contributions, or select Add a Post to post their own contributions.